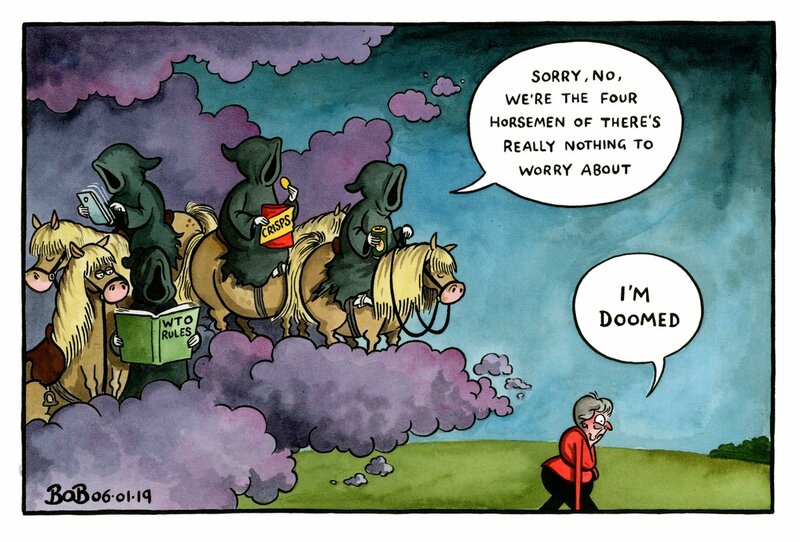 Britain’s former trade secretary Lord Lilley has produced a report which sets out to prove that Prime Minister and fellow Conservative Theresa May’s predictions of an apocalypse in case of a no-deal Brexit are overstated. 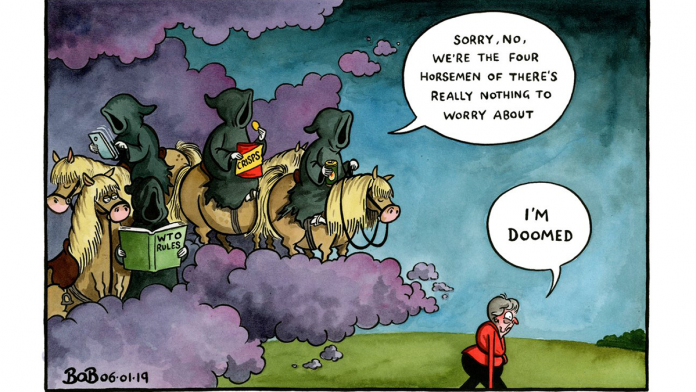 Bob Moran for The Telegraph takes a potshot on this issue, illustrating May’s encounter with the Biblical ‘Four Horsemen of the Apocalypse’. Israeli Prime Minister Benjamin Netanyahu might face indictment on corruption charges even before his country goes in for early polls. 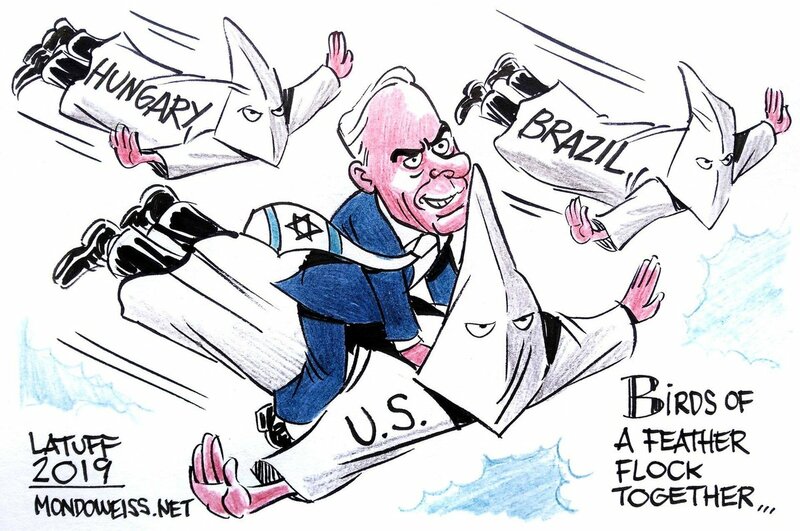 But for now, Carlos Latuff shows him ‘flocking together’ with other right-wing world leaders such as US’s Donald Trump, Brazil’s Jair Bolsonaro and Hungary’s Viktor Orban, who are all dressed in Ku Klux Klan outfits. 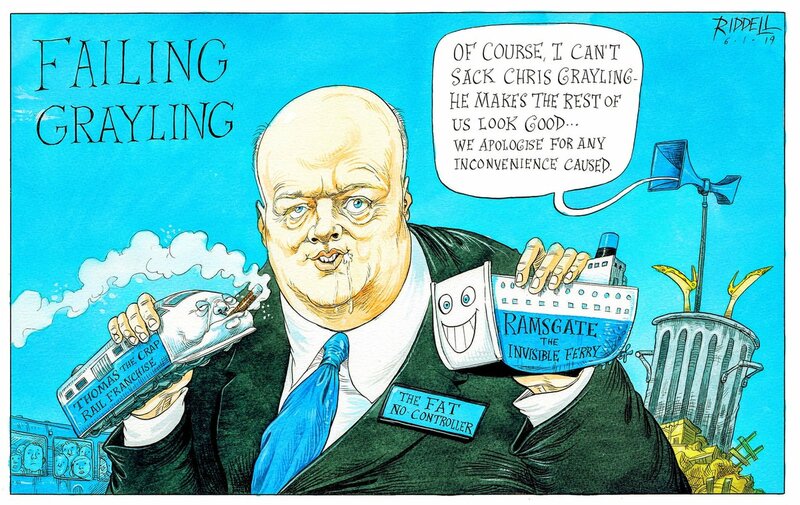 Chris Riddell in The Guardian takes a jibe at British transport minister Chris Grayling, who has been facing ire for awarding a vital emergency ferry contract to Seaborne Freight, a firm that doesn’t own a single boat. PM Theresa May, with her feet sticking out of a dustbin, announces that Grayling can’t be sacked, because it makes the other members of the British cabinet look good. 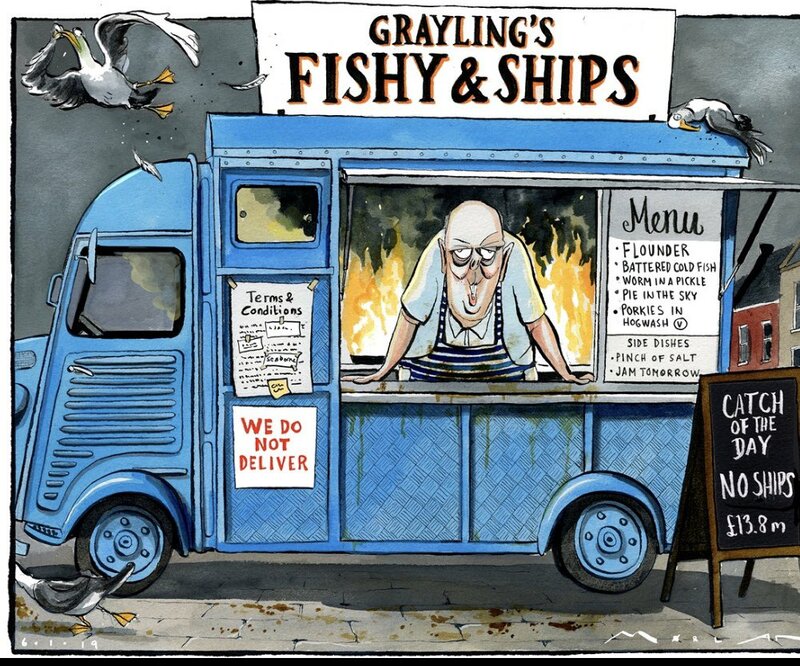 Morten Morland also takes a dig at Grayling, calling out his ‘fishy’ move of awarding the contract to Seaborne Freight. 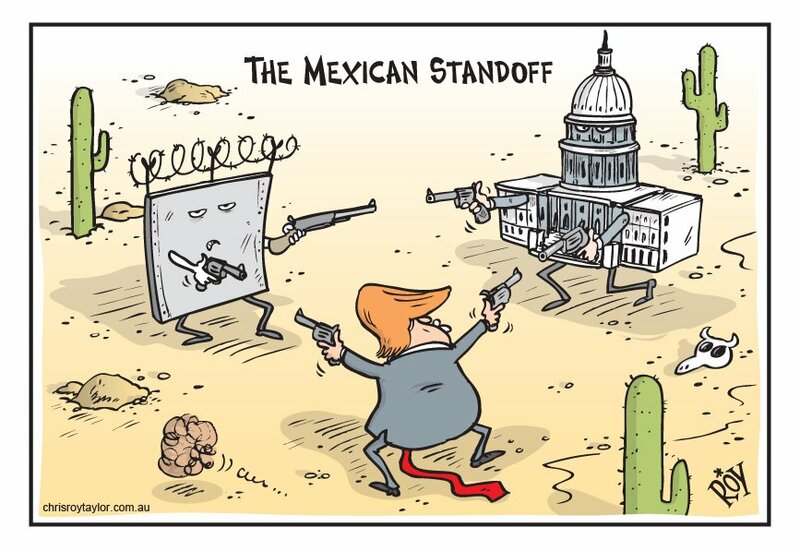 Chris Roy Taylor depicts a ‘Mexican standoff’, which literally means a three-way confrontation without an end, between US President Donald Trump, the US Congress (represented by the Capitol building) and the wall Trump wants to build. Trump has threatened a National Emergency and a shutdown of government for months or even years if the wall is not built immediately. 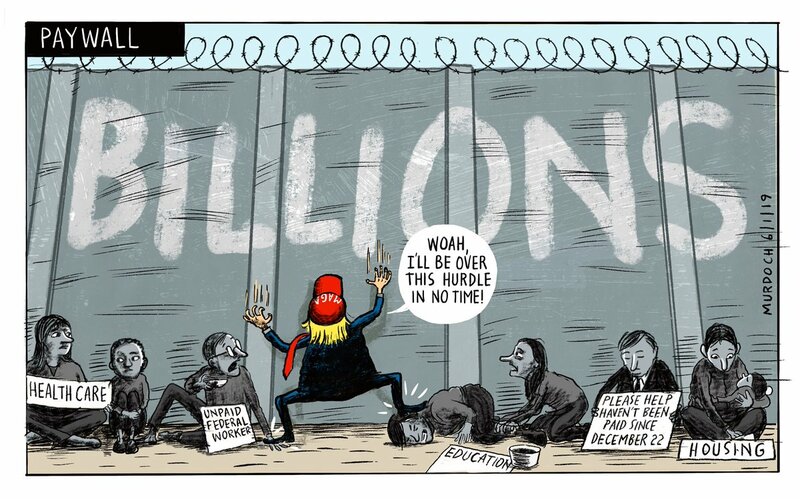 Sharon Murdoch illustrates Donald Trump wearing a #MAGA (Make America Great Again) cap, and keeping his focus on the Mexican wall, while not bothering to look at the variety of problems afflicting American society.